Sherlock Holmes’ reputation as the greatest sleuth of our time was such that there was never a lack of those who sought his help. The variety of cases brought to him was as varied as crime itself. It was more the challenge a particular case presented than the case itself that compelled his interest. It was the evening of the 20th of April, 1890. I arrived back from Greatham, where I visited Lord and Lady Marshall. His Lordship and I served together in India. My visit provided an opportunity to recall shared adventures in one of the most enchanting corners of our empire. We shared a bottle of sherry and filled the air with the sweet aroma of some of the finest Cavendish that ever filled the bowl of a pipe. The return trip to London was uneventful. I arrived at Paddington Station just before 6:00 p.m., and immediately took a hansom cab to Baker Street. Mrs. Hudson greeted me as I entered. Mrs. Hudson appeared to be somewhat upset. She was rubbing her hands together, and there was a definite look of concern, if not worry, in her face. “Is something bothering you, Mrs. Hudson,” I inquired out of genuine concern. Mrs. Hudson was obviously concerned about Holmes. She moved about wringing her hands together. She stopped, looked at me and began to explain what was troubling her. “And that was unusual?” I asked. “Well, not at first,” she replied, and then continued. I admit that I was having some difficulty understanding why Mrs. Hudson seemed to be so troubled by this particular package. “I’m not sure there was anything really unusual. Like you say, Dr. Watson, packages do arrive from time to time for Mr. Holmes, or yourself.” She paused, as if trying to reconstruct the whole episode from memory. She looked straight at me and continued in a low voice as if wanting to be sure that she would not be overheard by someone other than me. “I’m not so sure,” replied Mrs. Hudson. After bidding Mrs. Hudson good night, I ascended the stairs to our rooms. When I entered, I immediately observed Holmes sitting in his chair, staring straight ahead as if deep in thought. The mysterious package was sitting on the end table beside the chair just where Mrs. Hudson placed it, still unopened. “Filled me in? Filled me in about what?” I asked. “The events of the afternoon,” Holmes answered. “I notice you haven’t opened the package.” Of course, I was merely stating an obvious fact, but I did so in a tone that would elicit a response. 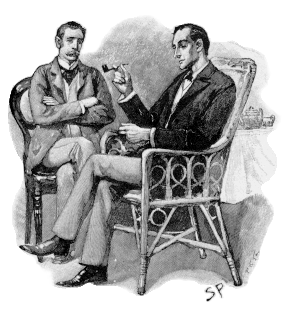 I had no doubt that Holmes was able to do just that, but I knew also that to say nothing, was not what he expected. We were playing a game, one which began when I entered the room. Holmes made the first move when he commented on Mrs. Hudson’s habit of keeping me informed about his every move when I was absent. I said no more and neither did Holmes. Only moments later, there was a knock on the door. Mrs. Hudson appeared, carrying a much appreciated tray with tea and biscuits. She never failed to bring refreshments when either of us returned from a long journey. Holmes did not acknowledge her presence. That was not in itself unusual. He could be the very model of a gentleman towards Mrs. Hudson. At other times, when he was preoccupied, it seemed that not even an earthquake would disturb his train of thought. Mrs. Hudson said nothing. She paused, looked at Holmes, and then gave me the usual look that said she understood. I poured myself a cup of tea, and then sat down to read the evening paper. The minutes ticked by. Finally, I could stand the stress no longer. I quickly folded the newspaper in my lap. “Holmes!” I said, in an obviously frustrated voice. Holmes rose from his chair and slowly walked across the room. He picked up the package from the end table. He turned the package in his hands as if examining it, as I became more anxious. It was his move, and he was relishing every moment. Holmes did not mean to belittle me. I was well aware of his respect for my own ability to deduce a conclusion from careful observation of the problem put before me. “As a medical doctor trained to diagnose an illness from a set of often baffling symptoms, I would expect nothing less than a keen sense of observation from you,” he often said to me. It was his indirect way of complimenting me without having to display any human emotion. He sat down in the chair opposite me and in his usual manner began to explain. Holmes sat silently staring at the package. After what must have been a couple of minutes, he handed the package to me. I began slowly to remove the wrapping. Once the package was unwrapped, I glanced up at my friend. Holmes was staring at what was now only a small box. There was no sign of emotion or anticipation on his face, only a blank stare. I opened the box and looked in. The only contents, other than tissue paper, were a postcard and a folded note. The postcard was of an inn with white capped mountains in the background. Judging from the architecture of the inn and the snowcapped mountains, I felt safe in concluding that the location was either in Switzerland or Austria. I handed the folded note to Holmes. He read it, then carefully folded it and laid it on the end table. Without saying anything, he crossed room, picked up his violin and began playing a soft tune, as if remembering a special moment in the past. This entry was posted in Short Story and tagged Dr. Watson, Hudson, Mrs. Hudson, sherlock holmes, Watson. Bookmark the permalink. Ah, “The Woman.” I love this!